I attended a free Advance Screening in exchange for my honest opinion. 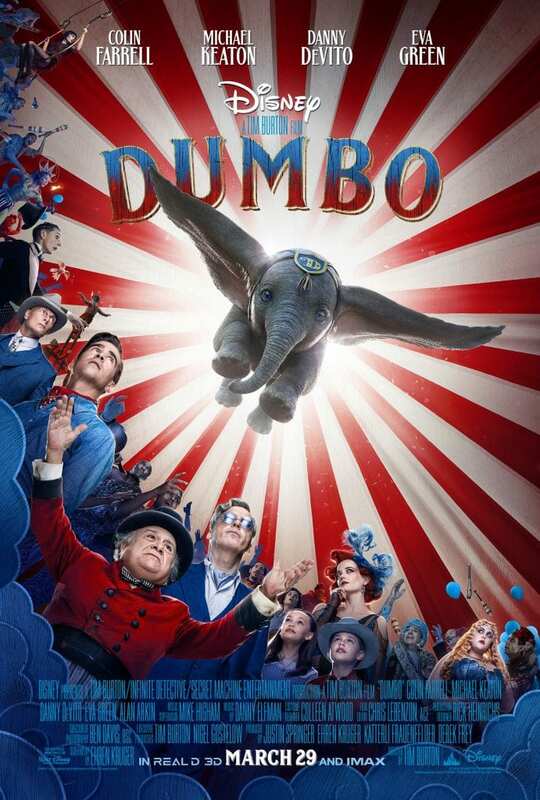 DUMBO is a collaboration of Walt Disney Studios and director Tim Burton in a retelling of the classic Oscar™ musical score winning Dumbo story. An amazing all-star cast, including Colin Ferrell, Danny DeVito, Michael Keaton, and Alan Arkin, takes this well-known story to an all new level with the live-action movie feature. With music direction from the renowned Danny Elfman, and state-of-the art visual effects, the movie is amazing. The movie is available in several platforms—we saw it in IMAX 2D. While the movie is rated PG, don’t expect it to be cutesy like the animated version. The movie begins in post-WWI America; Holt Farrier is reunited with his children at the Medici Bros. Circus. His wife has passed away while he was gone and he lost his arm in battle. The circus is struggling, and the owner, Medici, has sold Holt’s livelihood—his stallions for his routine—and some of his possessions. The children want nothing to do with the circus. Medici offers Holt the job of caring for the elephants, as he has a new one, Jumbo, and she’s about to give birth. When they discover Jumbo’s baby, they see Jumbo Jr.’s ears are enormous; the decision is to hide the ears for the act so it won’t hurt ticket sales. Meanwhile, the Farrier children, Milly the budding scientist and her brother Joe, love to be with the baby elephant. They can empathize with the baby as he is kept separate from his mother. Trying to entertain the elephant using a feather, and through this encouragement, they discover the baby elephant can fly. They try to tell their father, but he and others in the circus don’t take the time to listen. When they put Jumbo Jr. into a routine and cover his ears with a bonnet, all goes wrong when the baby elephant sees a feathered hat in the crowd. Chaos ensues when Jumbo Jr. uses the feather to fly, his ears are revealed, and everything goes haywire. People label the elephant Dumbo, and the name sticks. 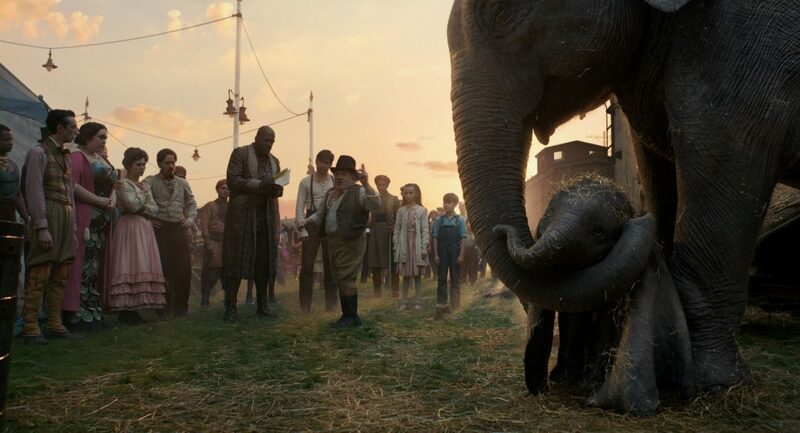 CIRCUS FAMILY – In Disney’s all-new live-action adventure “Dumbo,” circus owner Max Medici (Danny DeVito) and circus performer Rongo the Strongo (Deobia Oparai)—plus the rest of their big-top team—welcome a newborn elephant with oversized ears to their tight-knit family. Directed by Tim Burton, “Dumbo” flies into theaters on March 29, 2019. ©2018 Disney Enterprises, Inc. All Rights Reserved. In order to raise capital and get rid of what Medici sees as a loss, Dumbo’s mother is sold, and the circus moves to another town. The Farrier family creates an act for Dumbo, but Dumbo misses his momma. The kids promise Dumbo if he does the routine, they can make money to buy his momma back. Word of Dumbo’s flying prowess gets out, and Mr. Vandemere wants him for his Dreamland. He offers Medici shares in his business to bring all of the circus to his creation. 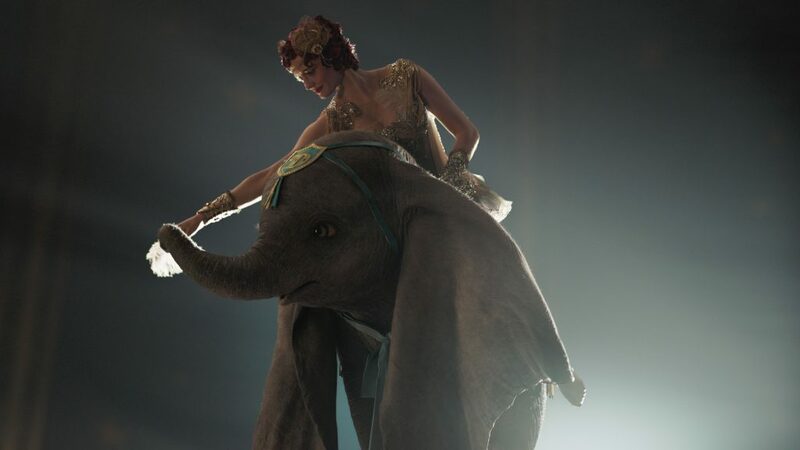 Arriving at Dreamland, an amusement park near New York–part circus, part carnival, and part exposition–a new routine is created for Dumbo using an aerialist, Collette. A wonderful musical scene with pink elephants in bubbles is a nod to the original movie. The act at the Colosseum within Dreamland is magical until it goes amiss. Vandemere is not all that he seems. He’s cash-poor and needs the financing from a famous banker. Everything is riding on the sensationalism he’s created from Dumbo’s act and nothing will stop him from getting what he wants. When the truth is known, the former-Medici circus members create a plan to stop him, reunite Dumbo with Jumbo, and set them free. In Disney’s live-action reimagining of “Dumbo,” accomplished aerialist Colette Marchant is paired with a flying elephant named Dumbo in a new act at a state-of-the-art amusement park called Dreamland. Starring Eva Green as Colette, “Dumbo” opens in U.S. theaters on March 29, 2019. © 2019 Disney Enterprises, Inc. All Rights Reserved. Dumbo definitely has the Tim Burton touch. The story reflects on the importance of family, and to believe what we need [to fly] is inside us—we don’t need a feather as a catalyst. Dumbo is an incredible and entertaining experience, dramatic, and it has that dark Tim Burton twist. The colors reflect the tone of the movie; it has epic musical scores, incredible visual effects with the live-action animals, and the mix of the post-WWI era with some modern things here and there (Dreamland’s ringmaster) make the movie magical. It’s a must-see family movie with something for everyone.